So, what does Re(i)nnovate™ mean? What is its context in the world of business model innovation? I have been reading, debating, discussing, and advising on innovation for some time now. And in all these interactions, one thing has stood out – that organisations must innovate or they will perish. Put differently, innovate now, or pale into irrelevance. That ultimatum made me think. It is not as if the big, medium, and small corporations of the world did not innovate. They did get here – somehow. There must be something that they must have done right. And doing things right does not mean that they went into copy-cat mode or simply repeated a successful business model, process, product, service, or a combination thereof. They did something right. And that premise is unshakable. Yet, how is it that these very organisations are now faced with a threat of survival? Surely, something is wrong with the basic assumption here. Or is it? Where do I get the cash from to finance this growth? The larger organisations are faced with a relatively similar set of problems – with one exception – they do not have a paucity of cash to finance growth. The question they are asking themselves is, how do I grow? At the same time, they also face larger organisational impediments – Size. The sheer size of these large organisations sometimes makes them sluggish. The new question that then pops up is, how do I carry the weight of my organisation into a co-ordinated growth phase? How do I bind my divergent businesses, my culturally diverse workforce into thinking as One Team, as One People? This goes down to the basics of – Is big lean? Can you be big and lean? What should I do to get lean? Must I break my organisation down into smaller, leaner parts, and then select those parts that are potential candidates for growth? Simply put, what do I do to usher an era of innovation into my organisational culture and processes, and actually innovate to make profit? The latter questions are the tough ones. The easy solution is – hey, I got lots of cash – can’t I do something with it? Can’t I buy some smaller already innovative fish? Surely, there must be lots of fish in the sea that are ready to be netted! And with that approach, quite a few large organisations, world over, went into buying sprees. They bought innovation. And then went about the arduous task of blending the new entrant into their organisation’s processes, culture, systems etc. It should be easy to blend the new entrant into my outfit – they thought. But, what they did not realise then is that they had ignored the organisational culture aspect earlier on, since it was very difficult to deal with it then, and top management was demanding some quick answers. So the easy way out was to buy out something with the cash available. Little did they realise that the unaddressed issue of sheer lack of preparedness of the organisation to absorb innovation into its “old” ways would come back to bite them in the back. These large organisations that actually completed acquisitions of “innovate fish”, must now examine themselves across 4 axis. Only those organisations that can actually act on the 4 axis noted above, will witness results that make them disruptive or radical. And it is true that several organisations have fallen by the wayside doing so. It is not difficult to achieve. Yet, it is not easy – since it requires a serious, focussed, and pointed approach to introduce innovation strategies, methods, culture, and tactics into your organisation. What about those organisations that do not have the cash, or were unable to shore up large cash reserves? What do they do? 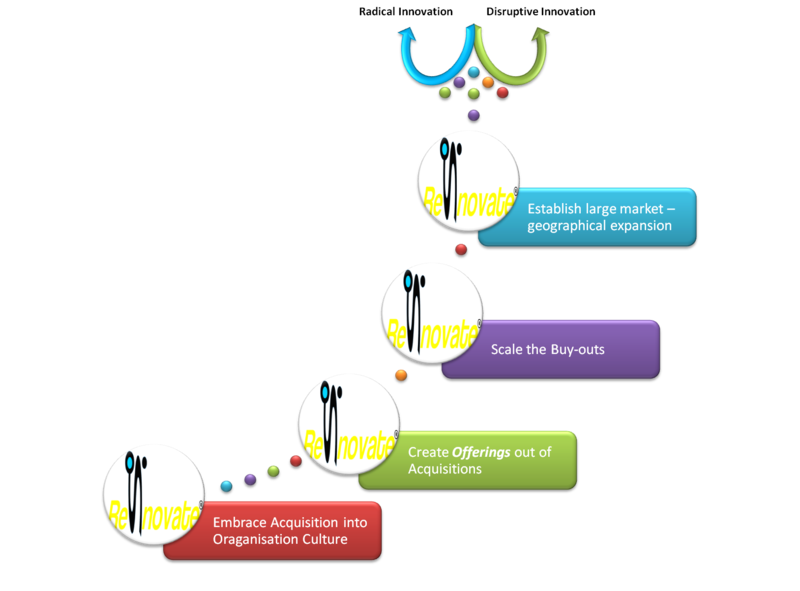 What is their path to seeking the elusive “innovation agenda”? The idea of re(i)nnovation™ is for such organisations. Larger ones can also take a cue! The real issue that we face today is a drying up of cash for innovations, inventions, improvements etc. The small and medium business (SMB) sector has great ideas, but they simply does not possess the cash to finance these new ideas. And therefore, new product/service innovations are far and few between in the current state of the global economy. So, my question stands: What can the SMB sector do to live today? When you look at this from an industry domain perspective, most SMB’s within an industry seemingly offer similar products or services. So how do they increase market share? How do they increase their top-line? How do they increase profitability? This is a question that looms large on a global, regional and local basis – especially for SMBs. All businesses survive within a constant state of inter-dependence. There is no one supreme power, no one is less or more important than the other. No one is independent of the other. And it is in this contextual state of existence that businesses grow, out-grow, dwindle, or die. And it is within this context that businesses also seek newness, uniqueness, a space they can call their own – an independently owned space – even if that independence is short-lived, because another business decided to seek that very same newness and occupied slot # 2 in that space. This quest for seeking impregnable market positions – as alone as possible – is what innovation is all about. I call it alone because all businesses love a monopoly; even if it’s for a short period of time. Some businesses learn to adapt into a non-monopolistic stage (as is true in the current global environment), but some of these businesses love to be the trend-setter, of being the first to occupy that space; of being the first-mover; of being the entity that captured the major market share. Innovation is not always about exclusivity that leads to a 100% market share. It is about creating that vital offering which customers want to buy; that competition can only vie for; that industry can herald in as the new era of progress and change. So how do businesses carve a white space for themselves, that allows them to create, design, and commercialise innovations? Businesses are always living in a present-continuous state. Their relative position is constantly changing within the context of their own business, and that of the ones they do business with. And it is in these relative fluid contexts that businesses seek out newness, uniqueness, and valuable offerings. The ability to perfect the art (or science) of seeking newness within relative fluid business contexts is the realm of true innovation. A starting point in this process of re(i)nnovation™ is to ask yourself a few questions. What is your core competency that no one else can provide? How do you articulate it into a value proposition? What separates your competition from you? What drives some of your existing customers, and some new customers, to the competition? What is your competitions capability in comparison to yours? What parts of your customer’s industry value chain do you participate it? What parts of your customer’s industry value chain does your competition participate in? Are your customers re-designing their business along their own, or their industry’s value chain? How quickly can you shore up new capabilities viz a viz your competition? What is the incremental cost of such capability? What is the incremental revenue this capability brings? How does your cost structure for acquiring new capability compare with your competition? What are those aspects of your customer’s business that might require improvements and what ways (products, services and/or offerings) do you have to provide such improvements? In other words, how can you identify un-met needs of your customers, and work aggressively to have them met? The ability to re(i)nnovate™ along the 6 value chain models, and business ecosystems, will give you the leverage to out-perform, out-think, and out-last the competition. Vibrate always – together as a team. Change your position, your strategy. Mystify your competition. All this is excellent. In fact it is precisely what you want to know an probably already know too. But, the question that you must be asking yourself now is: How do I go about achieving all of this? The whole agenda about re(i)nnovation™ is not in the why, but rather it squarely resides in the what, how, where, and when. Before we delve into the these aspects, let us look at some of the key innovations that have taken place. It is true that several quantum innovations have occurred in recessionary periods. But, in my view, that has not been the cause for driving innovation. I tend to believe that these companies put themselves into the shoes of the customer’s value chain, and then looked back at themselves – an almost “back to the future” approach. They then put themselves into the competitions’ value chain, and similarly looked back at themselves with the purpose of evaluating where they stood viz a viz the competition. This led them to spot improvements within their own value chain ecosystem, and that of their customer’s, and that triggered innovation. Let’s take a few cases in point. And I will try and cover two different industries, across two very different geographies. It does not matter that the examples are of large organisations – what is important is to understand how these organisations created completely new models, and simply re-used, re-articulated existing assets to cause disruptive innovation. They re(i)nnovated™. Read about these case studies in Part 3 of the series on Business Modelling & Collective Intelligence. Very good question – as you seek to understand the edifice on which InnoVision is built. “We challenge your present” – Organisations that wish to innovate must continuously challenge their status quo, with an aim to see if there are areas of improvement, newer markets that they can address, newer offerings that they can produce, see if they can sustain those, and finally in doing so move on to a path of innovation. The phrase refers to this. How we, as InnoVision, aid and assist organisations to challenge their status quo and guide them towards being an innovating enterprise. “We question your future” – As you look into the future from where you stand today, and predict certain events, markets, innovations etc for your organisation – ask yourself this – is the future that you envision “really” going to be just that? Is it possible that the future might alter course? The ability to question your outlook, to question your strategy, to question your projections, across all dimensions of your business, is critical to laying the foundation of a sound business plan, a sound innovation agenda. Radical, quantum, disruptive innovations all occur when you position yourself into the future and look back at yourself (your value chain, your ecosystem) – and that position in the future is not one single point – it can be many – as you are not there yet. So we at InnoVision, aid and assist an organisation in doing just that. I hope I have been able to address your question. thanks , Ananth . You can remove those comments. This feedback i wish you will take it in the right spirits.